One of the best places to stay in outdoors is the outdoor kitchen. For many homeowners, it’s not just a place for grilling barbecues or baking pizzas but also for relaxing, entertaining guests, and dining. Outdoor kitchens are flexible. They can be custom built to any size, shape, or design. They can be constructed using a variety of materials, too. All of these are only possible if you have an expert doing your outdoor kitchen planning, design, and installation. For New Jersey homeowners, a company that you can rely on is Brick by Brick Pavers and Landscaping. We can make outdoor kitchens that are based on your taste, lifestyle, and budget. Our design and construction team can build a stunning outdoor kitchen that will also add functionality to your outdoor living space and boost the value of your property. Brick Pavers and Landscaping can remodel your patio into an extraordinary outdoor entertaining and dining area! Pool outdoor kitchen – We can turn your pool area into a resort-like oasis. We can even add a fire pit or fireplace to make your poolside gatherings more comfortable. Open outdoor kitchen – If you don’t have a patio or a pool, another great option is a backyard outdoor kitchen. A space that’s close to your home is a potentially good spot. As the name implies, it doesn’t have any roofing. However, we can build a garden pergola if you want to add some visual interest to your outdoor kitchen. Covered outdoor kitchen – If you want to enjoy the same indoor comforts in your outdoor kitchen regardless of the weather, then a fully roofed structure is for you. Rest assured, your new outdoor kitchen will match or complement the architectural design of your home. Your satisfaction is important to us, and so we don’t start any project until we have your full approval on our design. We design using 3D CAD software to provide you a better idea of what the final result will look like. 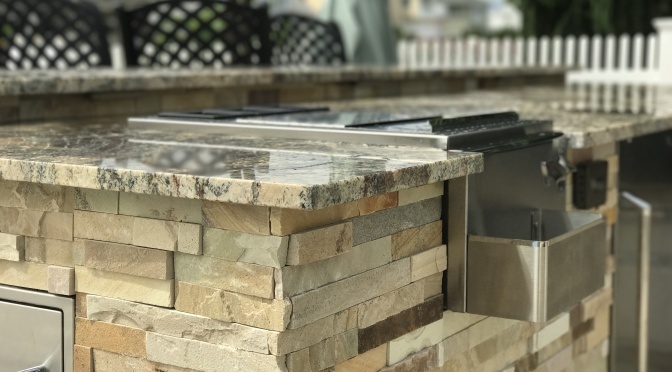 When building outdoor kitchens, we use only the highest quality building materials available to ensure that you get a long-lasting beautiful outdoor living space. We make your dream outdoor living a reality. Call us today!